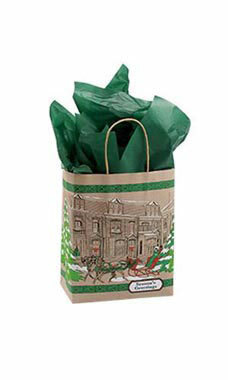 Medium Street Scene Paper Shopping Bags will have your customers feeling nostalgic for time gone by. The artful Street Scene Holiday bags feature the inscription "Seasons Greetings" to ensure your customers will be in a festive holiday mood when they leave your store! Featuring bold red, green, white and black shading this bag is truly a work of art that your customers will love carrying! Bags feature a Kraft interior and twisted rope handles for easy carrying of special gifts! Sold in cases of 25 bags.